A professionally dressed Mitzvah DJ will be the master of ceremonies for your Bar or Bat Mitzvah, providing party lighting, great music for the hora, and even announce the hamotzi! Our Mitzvah DJ will coordinate with other vendors and your venue to make your event flow smoothly. Prior to your party, your DJ will meet with you to finalize your play list and plan the order of events. Party Pleasers music database can be accessed directly on our website allowing you to make a private request list for your event. Your personal lists can include your “FAVORITES”, “PLAY IF POSSIBLE”, and “DO NOT PLAY” song choices. The DJ’s computer, filled with more than 30,000 songs, will be able to satisfy your music requests. It’s like bringing thousands of CD’s to your party! At your request, we will set up an online guest request list with over 50,000 songs, allowing guests to request their favorite songs! They can search by song title, artist, or decade, and can even see a tally of their friends requests. At your planning meeting, you will have the opportunity to remove any requests you do not want to hear. Energize your dance floor with our party lighting package or add a customize image projection for a personal touch. Be sure to review our mitzvah add-ons page for incredible lighting options. Add party starters to your event to mix with your crowd and liven your dance floor. Our party starters bring the fun by teaching dances, assisting with games, and encouraging guests to engage in the party! 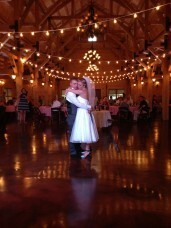 Click here to see Lighting, Decor and Venue Photos! Why Select a Wedding DJ Over a Live Band for Your Big Day?